Buddhists follow the steps of Gautam Buddha who taught the concept of four noble truths. Lord Buddha preached his noble virtues in Eastern India around 6th Century BCE. In Buddhism, there is a prominence of all the places that are associated with Lord Buddha. Buddhists seek the fragrance of Buddha's teachings and quest for inner bliss. The travelers with religious hearts can also savor the utter serenity of minds through visiting these places. 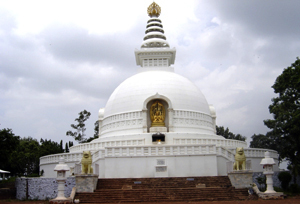 This 16 nights and 17 days itinerary takes the tourists on the footsteps of Lord Buddha. The tour includes various places of religious significance in Buddhism in India and Nepal. These destinations include visiting various tranquil places such as Patna, Vaishali, Rajgir, Nalanda, Bodhgaya, Varanasi, Kushinagar, Lumbini and Kathmandu. On arrival at Delhi airport in the afternoon, our representative will be there to receive you and transfer to your pre-booked hotel. Check in at the hotel. Rest of the time is free for leisure. An overnight stay at the hotel in Delhi. The day is free to explore the major tourist destinations in Delhi or local markets of Delhi. An overnight stay in the hotel. Today, we will fly to Patna, an ancient Buddhist capital of Patliputra. On arrival check in at the hotel for an overnight stay. In the morning after breakfast, we will leave to visit Vaishali, where the Buddha preached his last sermon. Later return back to the hotel for an overnight stay. After breakfast in the morning, we will drive to Rajgir, where Buddha preached at the "Vultures peak" and the first Buddhist council was held after his death. Here, we will climb the peak by cable car. En-route, we will visit Nalanda, one of the greatest universities of the ancient world. Enjoy an overnight stay at the hotel in Rajgir. Today, in the afternoon, we will drive to Bodhgaya, place of Buddha's Enlightenment. Check in at the hotel in Bodhgaya for an overnight stay. 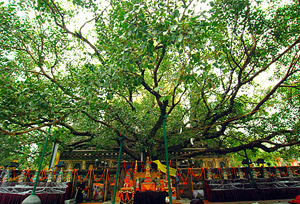 In the morning, we will visit the Mahabodhi temple and sit under the Bodhi tree of enlightenment. Later return back to the hotel for a night stay. Today, we will drive or board the train to Varanasi. On arrival in Varanasi, check in at the hotel to relax and enjoy a night stay. After breakfast in the morning, proceed for a dawn boat ride on the sacred river Ganges, where devotions are performed towards the rising sun. Also, you can see the funeral Ghats, and some of the Varanasi's temples. In the afternoon, visit the great Stupa at Sarnath, where the Buddha preached his first sermon. Later return back to the hotel for an overnight stay. Today, the morning time is free for leisure. In the afternoon, board train to Kushinagar. On arrival at Kushinagar, our representative will be there to meet you and take you to your prebooked hotel where you can check in and enjoy an overnight stay. 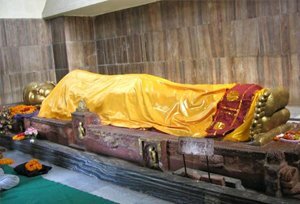 In the morning after breakfast, we will visit the ancient stupas and modern temples, commemorating the Buddha's Death and cremation, and see the spectacular reclining Buddha Statue. Later, come back to the hotel to relax and enjoy a night stay. Today, we will drive across the border into Nepal to Lumbini, birthplace of Buddha in the morning. After exploring the beautiful Lumbini, enjoy an overnight stay at the hotel in Lumbini. The morning time is few for leisure. Later, in the afternoon, take flight to Kathmandu. On arrival in Kathmandu, our representative will transfer you to your already booked hotel in Kathmandu for an overnight stay. 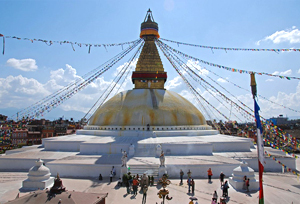 After breakfast in the morning, we will visit the two ancient and magnificent stupas of Swayambunath and Boudhanath. Rest of the time is free for shopping and exploring the city of Kathmandu. Later return back to the hotel for a night stay. Today, we will visit the village of Nagarkot, with stupendous views of the Himalaya and Kathmandu valley or another option available is to trek to 14th Century World heritage temple of Changu Narayan. An overnight stay at the hotel in Kathmandu. In the afternoon, we will fly to Delhi and enjoy an overnight stay at your pre-booked hotel in Delhi. In the morning, we will transfer you to the airport to catch the flight for onwards international destination.